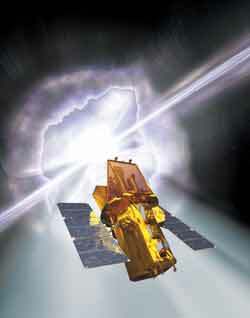 The Swift observatory is one of NASA's Explorer missions, and is designed to locate and study one of the most intense explosions in the universe, Gamma Ray Bursts (GRBs). These bursts occur randomly across the sky and can last from a few seconds to more than a minute. On board the Swift observatory are three instruments; the Burst Alert Telescope (BAT), X-Ray Telescope (XRT) and the UltraViolet/Optical Telescope (UVOT). The BAT detects and locates the position of any GRB that occurs within its wide field of view. Then, using this information, the spacecraft rapidly slews round to allow the other two narrow field telescopes (XRT and UVOT) to observe that part of the sky and study the afterglow from the GRB in their respective wavelengths. The Swift was successfully launched from Cape Canaveral Air Force Station, Florida on 20 November 2004. An unmanned Delta 2 rocket put the satellite into orbit, approximately 400 miles above the Earth.